Chicken Parmesan is one of my all-time favorite dinners. What's not to love? Crispy chicken, tomato sauce, melted cheese... all good things. However, what with being in the beginning stages of summer, I'm more apt to crave lighter dinners. This dinner definitely fits the bill. I feel like fish - especially something like tilapia - is typically lighter in taste than chicken. Plus, it cooks in no time flat. Definitely a plus. Rather than smothering the meat in a heavy tomato sauce and a blanket of melted cheese, I topped it with a salsa of sorts - roasted cherry tomatoes, cubes of mozzarella, and lots of fresh basil. You could certainly serve this over some pasta, but I opted to go with a bed of baby spinach. Any spin on chicken parmesan is fine by me, but I especially like this lighter and summery take on it. Bring on the summer! For the roasted tomatoes, preheat the oven to 400 degrees. Toss the tomatoes with the oil, salt, and sugar. Spread in a single layer and cook about 20 minutes, tossing once. Remove from the oven and allow to cool slightly. Using tongs, transfer to a medium bowl, squeezing some of the tomatoes to break them (it lets the juices permeate the whole salsa). Toss with the mozzarella, basil, and balsamic vinegar. Season to taste with salt and pepper and add more oil if necessary as well. Set aside. Meanwhile, prepare the tilapia: Set up an assembly line with three shallow bowls (pie plates work really well too!). In the first bowl, add the flour and a pinch of salt. In the second, beat the eggs with the milk/water. In the third, mix the panko, Parmesan, salt and pepper, and garlic powder. Preheat 2 tablespoons of the oil in a large nonstick skillet over medium heat. Season the tilapia filets with salt and pepper. One at a time, dredge the tilapia in the flour, then dip in the egg, allowing excess to drip off. Finally coat with the panko/parmesan mixture, pressing lightly to adhere the crumbs to the fish. Repeat with the remaining pieces. Working 2 pieces at a time, cook the tilapia in the oil about 2-3 minutes per side, or until it flakes easily with a fork. Remove to a paper towel-lined plate and repeat with the remaining fish. Divide evenly among serving plates and top with the roasted tomato salsa. Serve immediately. Josie, this sounds incredible! 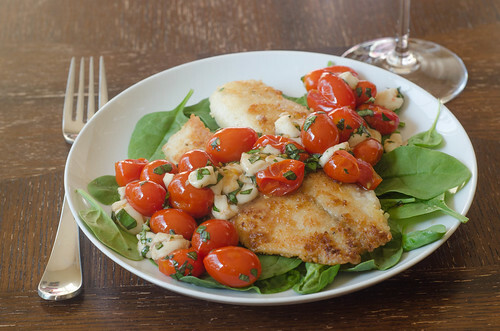 I love the simple roasted tomato caprese on top, and I am also a fan of tilapia and chicken Parmesan. Sounds like a winning recipe to me! I had kind of written of tilapia, but I recently tried a parmesan tilapia recipe that didn't have the panko and was baked...so good! I want this caprese topping next time! Tilapia convert. I'm all over this dish - we've been trying to eat more fish, so I'll put this on the menu soon. I'm a big fan of recipes that use cherry tomatoes. There's just something about the concentrated tomato flavor that brightens up a summer dish. Josie, this looks so good! I love the flavors that are in this and the crusted Parmesan on the fish is to die for. I would seriously eat this all week, it looks really GOOD!! caprese is my favorite part of summer and definitely makes this dish totally droolworthy! I love anything involving caprese salad, this looks delicious! 4 words. So good. New favorite!